Bilingual toys and products are, as usual, high on our gift list, so I am always looking out for new companies that cater to this market. 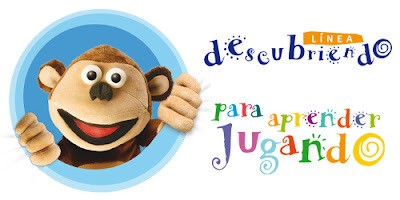 And this year, I discovered Witty Planet, which is the first company in the United States to carry Línea Descubriendo, a line of educational products created in Argentina by Primeros Pasos Argentina, professionals in childhood development. In fact, the line has been embraced by many Latin American countries, similar to the way in which the American lines, Baby Einstein and Brainy Baby, have been here in the States. But Línea Descubriendo is even better, with original songs and content that creates a richer, more effective product. The whole line centers around a cast of puppets, including its mascot, the adorable monkey named Bubba (pronounced BOO-bah) depicted in the logo above. Both my children love him. And it's no wonder considering that all of the puppets were developed by puppetmaster Roberto Docampo, Director of the Puppetry School at the San Martin Theater, in Argentina. Descubriendo's DVDs and CDs invite children to learn through play, song, and dance - a combination that my children (and probably yours, too!) can't resist. You can read my review of their DVD, Descubriendo Mi Cuerpo, over on the LBBC. But they also offer a series of flash cards, which I have incorporated into our classtime. We have the alphabet cards, El A B C de Bubba, which have turned out to be a great teaching tool. I am, of course, using them to introduce the Spanish alphabet to my kids. The cards are big - approximately 4 1/2 in. x 7 1/2 in. - and come on a very sturdy board background...perfect for little hands. And they are designed really well to provide you with a lot of information for each letter. • and there is an example of the upper case and lower case letter in the corner. • and an image of the upper case and lower case letters with guide marks (arrows) to show how the letter is formed. I've been using the cards to reinforce the letters that my daughter is learning in her Spanish curriculum, so I started out by pulling out all the vowels first, and reading them to her. Then I would give her the sound the letter makes and ask her to point to the letter that matches the sound. I've also had her pick out the cards to spell her name. But there are many other games you can play with your kids, and in fact, the box comes with a suggested list of 12 games. Now these cards are written completely in Spanish, so the riddles and the statements on the front may be a little difficult for beginning Spanish learners, but for those of you who are raising your children in Spanish, this should not be a problem. And even if your children don't understand every word, remember that it doesn't take them long to learn. It's also very important to train their ears to hear the language, including pronunciation, inflection, etc. I love how the cards are so versatile and can be used to increase vocabulary, discuss nouns and adjectives, color recognition, develop critical thinking skills (the riddles), and develop literacy skills at different stages (i.e., preschoolers: letter recognition, beginning to write, beginning to spell; and elementary: beginning and advanced readers). And to be one of the first families to experience these products in America, you can visit Witty Planet's website and order any of their DVDs, CDs, or flash cards. Their website is available in both English and Spanish. Don't forget to type in the coupon code LATINBABY for an additional 10% off your purchase! Disclosure: This post is part of a paid campaign. However, the opinions expressed in this post are sincere and true. Mommy Maestra WILL NOT endorse products that it does not approve of or that we feel will not interest our readers.